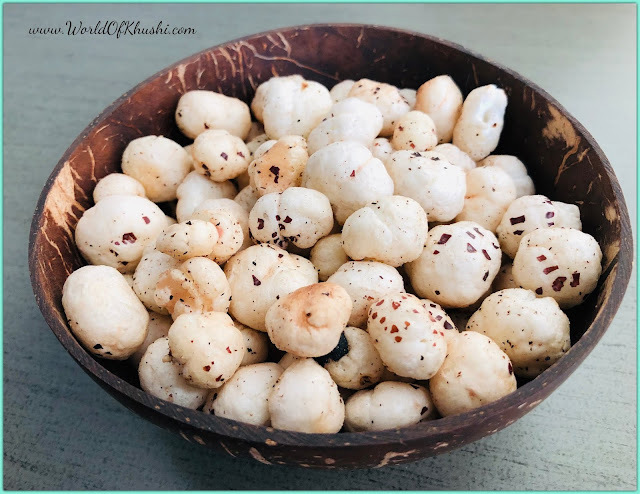 Lotus Seeds or Fox Nuts or Makhana is highly nutritious. Today we are sharing one of my recent favorites, a quick and healthy snack, Roasted Makhana Recipe. Roasted Lotus Seeds Recipe is very easy to make and for fasting food options makes a good choice. It contains fewer calories and high fiber and this makes it beneficial for people with diabetes too. For people who like to remain young forever eat Makhana. Lotus Seeds contains enzymes which promote collagen and restores inadequate protein levels necessary to have healthy skin. There are a lot of other health benefits of Lotus Seeds too which I will share some other day. For today lets indulge into this tasty snacks and see how to make Roasted Makhana Recipe. Step 1. Take a pan and put some ghee into that. Step 2. Now add Lotus Seeds ( Makhana ) in the pan. Mix well with the ghee. Step 3. Add desired salt and black pepper on top of Makhana. Mix again. Step 4. Roast Makhana until light brown or crispy. Your delicious Roasted Makhana is ready to be munched. Note - Put the flame on medium, not too high, otherwise the Makhana can burn. Roasted Makhana Recipe is very easy, filling and you can store this and eat it later too. I hope you will like this food. For more delicious recipes stay tuned with Khushi's World! If you are interested in more snacks recipes then click here. Please show some love and support by liking and sharing this Post!! Follow me on Khushi's World Facebook Page, Instagram, and Pinterest. I will see you in the next post till then take care! !